Story by: Story and photos by SPC Richard Mayfield - , New York Guard. 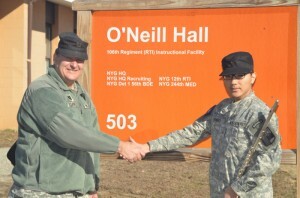 CPT Coates, Commander of the 89th Army Band, welcomes PV2 Hondo to the New York Guard. CAMP SMITH TRAINING SITE, CORTLAND MANOR The commander of the 89th Army Band, New York Guard, Captain Roy Coates, is welcoming two new members. Private Tatsuya Hondo recently enlisted in the New York Guard and has been assigned to the 89th, while Sergeant First Class (retired) Paul Myruski, New York National Guard, will be swearing in later this year once he completes the transition from National Guard service to the New York Guard. SFC Myruski is no stranger to the military; he joined the West Point Band in 1976 and was a participant in many exciting performances and events as we celebrated our nation’s Bicentennial. He went on to serve for 32 years in the National Guard including a 2005 deployment to Iraq with the 42nd Infantry Division Band. Myruski early on developed a love of music in high school playing the clarinet. He graduated from Orange County Community College, granted his Bachelors from University of Houston and then attended SUNY Binghamton for his Masters. Once he completed his education, Myruski taught music to inmates at the Eastern Correctional Facility Napanoch, New York and currently teaches as a music teacher for the Warwick Valley Central School System. It was during his time at Napanoch that he was recruited into the 199th New York Army National Guard Band. Myruski is deeply involved in his community and believes that service in the New York Guard will be a continuation of a lifetime of service to our military. He currently lives in the Town of Greenville with his wife Fern and they have one daughter Alyssa. PV2 Hondo enlisted on November 7, 2016 with the desire to participate in Veterans Day programs and has been actively practicing and performing with the 89th Army Band ever since. Hondo began playing the piano at the age of six and is now an accomplished flutist. He is currently attending the Adelphi University majoring in Anthropology. Hondo views his service in the New York Guard as one of giving back to his community and developing his skills as a musician. The “General’s Own” 89th Army Band is the official band of the New York State Guard, a unit of the NYS Division of Military and Naval Affairs. The New York Guard is the state’s defense force. This year the New York Guard will celebrate 100 years of service to the people of the State of New York.